Day 14 of the Alaska legislative session continued the Legislature’s streak of largely insubstantial days. Fog cancelled much of the day’s meetings and the House remains without organization. The biggest news of the day was the submission of two supplemental budget bills by Gov. Michael J. Dunleavy: Senate Bill 38, which grows the state’s funding for its earthquake cleanup and response, and Senate Bill 39 that reopens the budget passed by legislators last year. The second bill is going to get most of the attention because it proposes eliminating $20 million in one-time education funding the Legislature approved as part of a its 2018 budget deal. It axes about $3 million that had been set aside for the Village Public Safety Officer program. It also returns some $5 million from the Alaska Gasline Development Corporation to the general fund. The stated purpose of the cuts and transfers is to offset new spending in the bill: A roughly $3.6 million increase to the Alaska State Troopers for pay raises and retention, the $15 million of Medicaid funding the Legislature refused to fund in the 2018 budget and $2.5 million for the renovation and relocation of the Women’s Integrated Mental Health Unit at Hiland Mountain Correctional Facility. There’s a bunch of other around the edge changes proposed in the bill, but these are the big ones that will get the attention. The net impact of the second appropriations bill is “the return of $5,817,200 to the general fund,” according to the governor’s budget office. So how’s it going over with the Legislature? “I was under no intention of doing that,” said Sen. Gary Stevens, R-Kodiak, chairman of the Senate Education Committee, told the Anchorage Daily News. Both bills will be up in the Senate Finance Committee today at 9 a.m.
First of all, this is the first look at the governor’s budget priorities as legislators asking for details have been told to wait until Feb. 13 for the governor’s budget. The takeaway being that everything is on the table. But more importantly it highlights the risk with relying on the Legislature to fund just anything into the future (though this education funding isn’t even forward funding, but was set to be paid out this fiscal year). As everyone should have learned by now, one legislature cannot bind another. Of course, this comes at a time when the governor is also asking the Legislature to promise to pay back dividends with additional $600 million to $800 million draws from the Alaska Permanent Fund’s earnings reserve account over the next three years. The apology comes amid heightened scrutiny of Gov. Michael J. Dunleavy’s appointments, which shed light on Randolph’s Twitter account that’s since been made private. Randolph’s apology basically boils down to: I didn’t intend for anyone to see it. The only hearing in the capitol on Monday was another unofficial meeting by pieces of what you might expect to be a House Finance Committee. They heard an update from Alaska Permanent Fund Corporation CEO Angela Rodell that essentially stressed what we’ve been hearing for years: The Alaska Permanent Fund and its investment system functions best when it has rules to follow. As for any new direction under the Dunleavy budget, Rodell told legislators she had yet to hear anything. “Not a whole lot, stay tuned,” she said. “We’re still waiting as well,” Rep. Tammie Wilson responded. There wasn’t much going on in the capitol, so Rep. Laddie Shaw went out to take advantage of Juneau’s mountains in a way only he could. 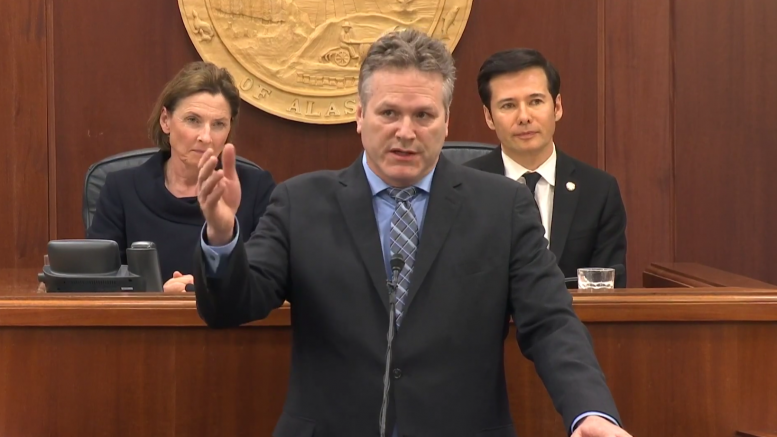 Be the first to comment on "AKLEG Day 14: Dunleavy seeks to cut $20 million in already-approved education funding"